One of the questions I get asked the most is whether I spend a lot of time preparing each meal. The answer is no, as when I get home from work I am usually too hungry to wait a long time before I can eat. 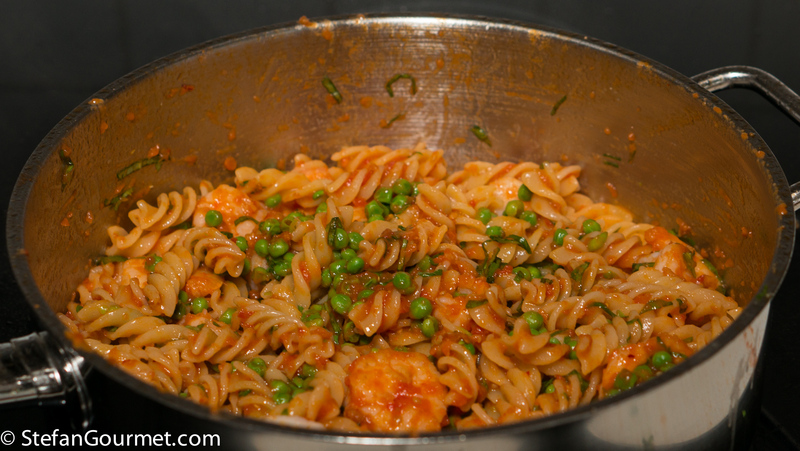 And so I prepare lots of quick but tasty dishes like this pasta with shrimp, tomatoes, and peas. I cooked and photographed this dish in July, and somehow it fell through the cracks so it hadn’t made it to the blog. Even though in November it is a bit out of season in many parts of the world, you can make this dish year-round using good quality canned tomatoes and frozen peas. As that will bring some summer to your plate, I decided to post it now anyway. 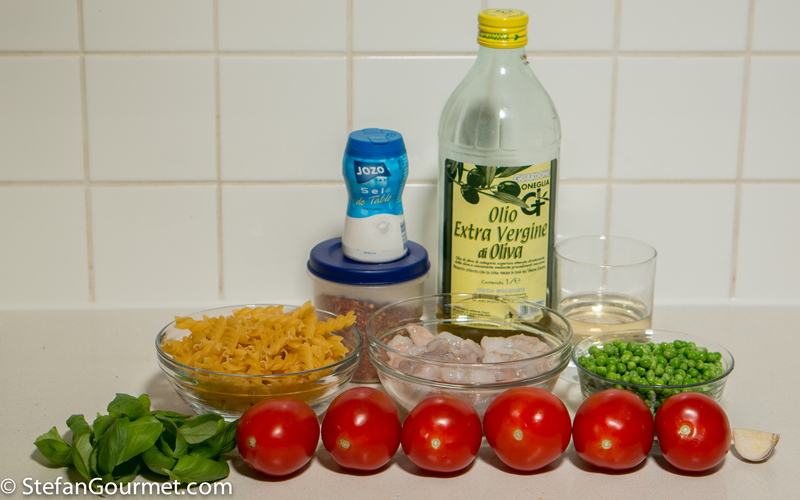 This is a quick dish that you can prepare in the time it takes to cook the pasta. It is also nice that you can have all the ingredients on hand without going to the market (if you have a basil plant growing, as all the other ingredients can be stocked in your pantry or freezer). 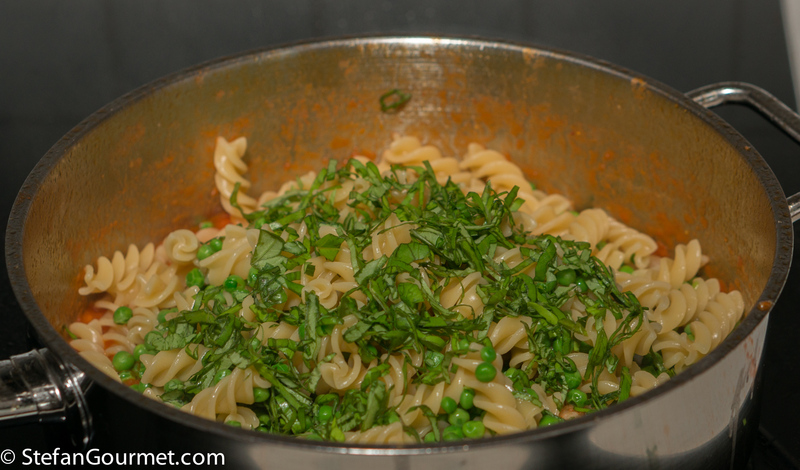 Fusilli is a good pasta shape for this as it ‘absorbs’ the tomato sauce very nicely, but another short pasta shape would also work. Bring a pot of water to a boil for the pasta. When the water boils, add salt and 150 grams fusilli pasta. Set the timer for the time indicated on the package for al dente. 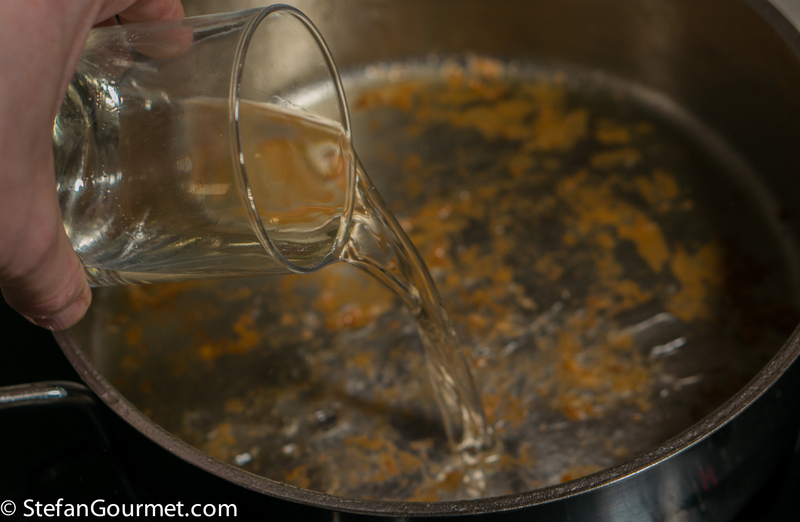 While you wait for the water to boil, heat 2 tablespoons olive oil in a frying pan and add a garlic clove. 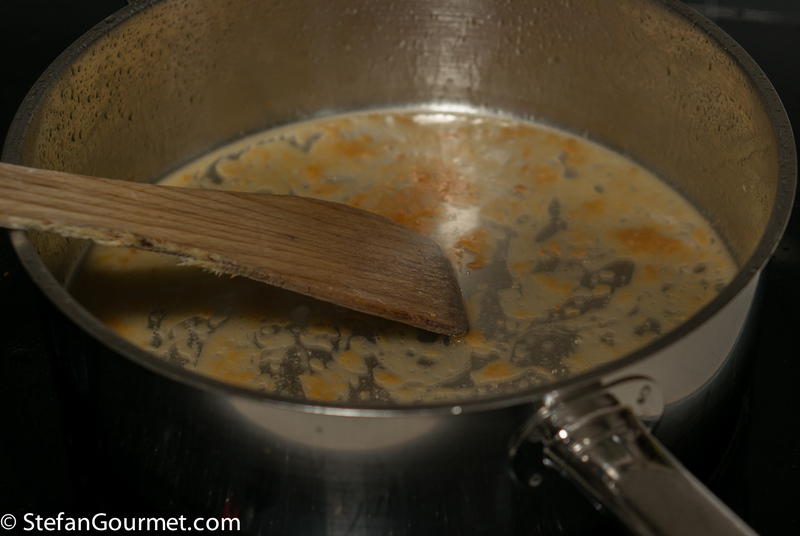 Tilt the pan and cook the garlic until it is golden on all sides to flavor the oil, then discard the garlic. Make sure to discard the garlic before it turns brown. If it does, start over to prevent a bitter taste. 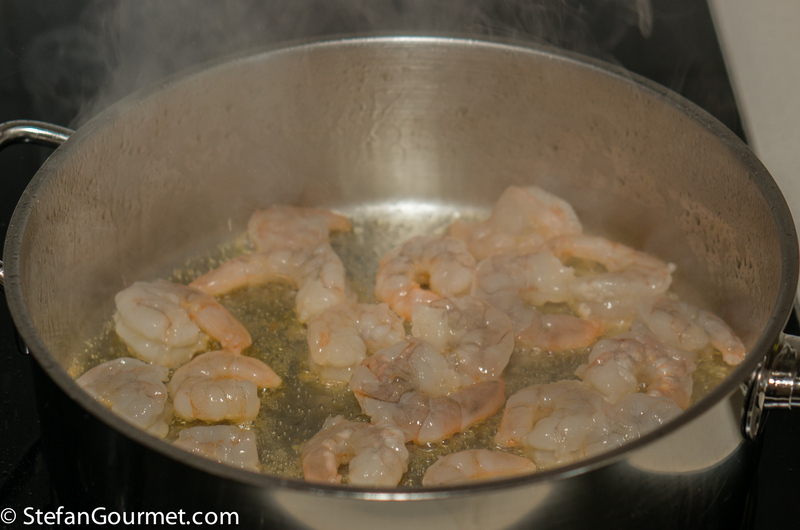 Cook 225 grams medium shrimp in the garlic-infused oil over high heat. 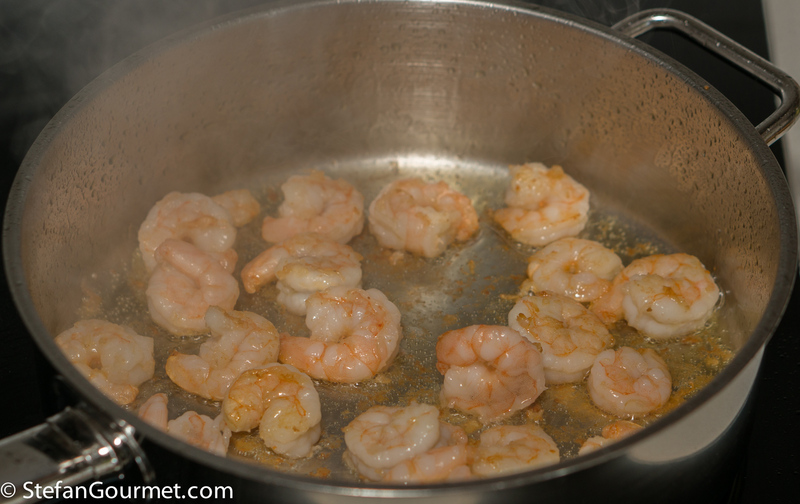 Turn the shrimp after a minute, then cook for a minute on the other side, and lift from the pan. Set aside. Deglaze the pan with 60 ml (1/4 cup) dry white wine. Scrape with a wooden spatula to loosen any shrimp bits that got stock to the pan. Puree 500 grams of fresh tomatoes or 400 grams of canned tomatoes in the food processor, then work them through a foodmill to remove the seeds and add them to the pan. Bring to a boil, then lower the heat to a simmer. Season with salt and 1/4 teaspoon of chilli flakes (or to taste). 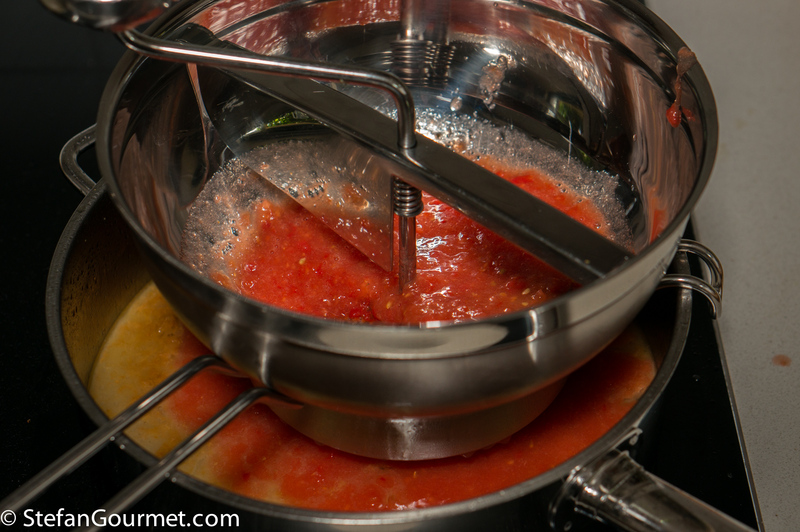 Cook the tomato sauce over medium-low heat, stirring regularly, until it is no longer watery. 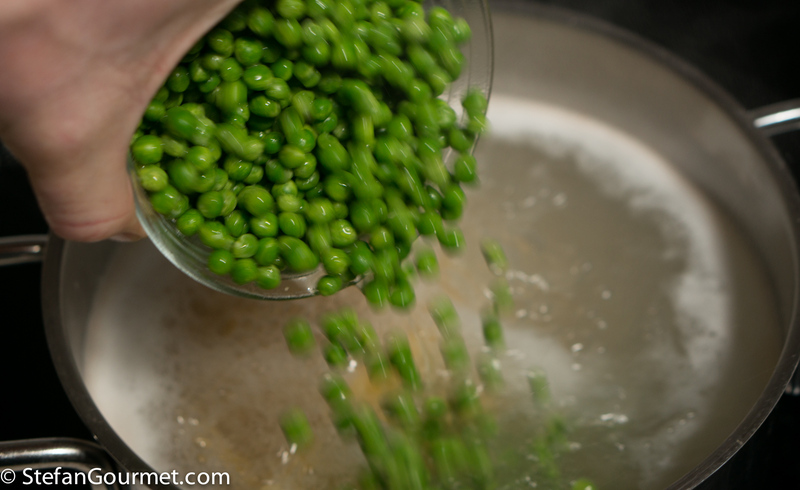 Add the peas to the pot in which the pasta is cooking a couple of minutes before the pasta will be al dente (the exact cooking time depends on the size of the peas and whether they come straight from the freezer or have already been defrosted. The peas should be tender but firm to the bite. 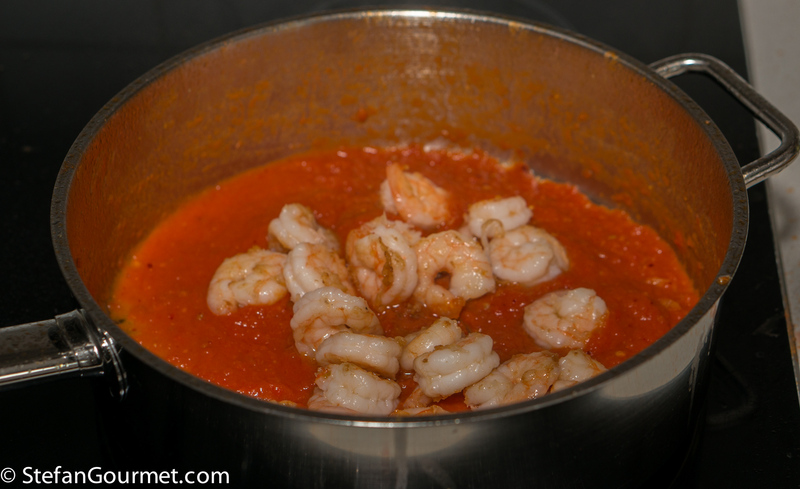 About 1 minute before the pasta will be ready, add the reserved shrimp to the tomato sauce and stir to incorporate. 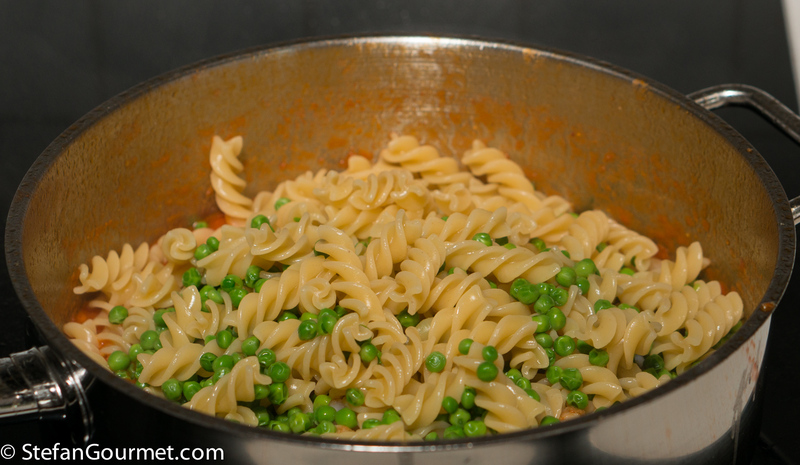 When the timer beeps, drain the pasta and peas, and add them to the pan with the sauce. 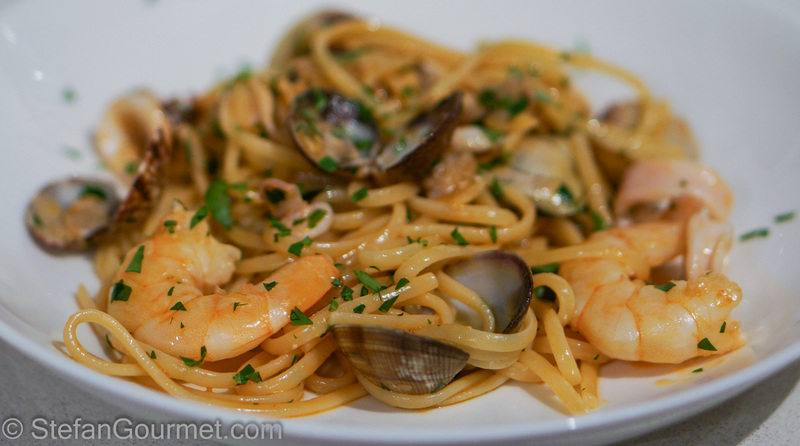 If you have more time and access to fresh seafood, then an alternative seafood pasta is this one. The secret to a great linguine ai frutti di mare is to use fresh seafood and to use the juices of the vongole and a stock made from the shrimp heads and shells for the sauce. It is a bit of work to make the stock and clean the fresh seafood, but it is oh so delicious if you love seafood. 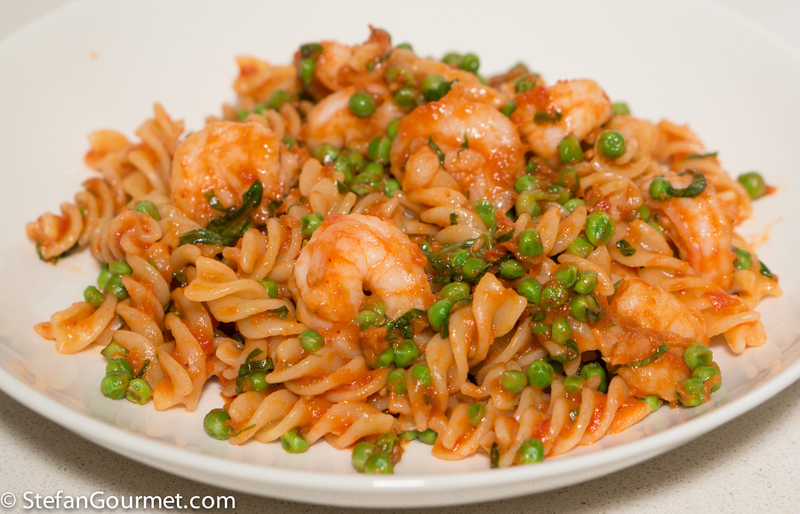 It can’t be compared to seafood pasta made with mixed frozen seafood, which is tough, hardly has any flavor, and doesn’t provide the flavorful ‘sauce’. The ingredients for this marvelous dish are simply pasta and seafood with a bit of olive oil, white wine, garlic, parsley, salt, and pepper. Since I am able to work from home and prefer my main meal, when alone, in the middle of the day – this is exactly the kind of fast, tasty, healthy recipe I like! We can get pretty reasonable tomatoes throughout the year, but methinks passata [hugely popular here lately] might fill the bill also? Definitely, as actually what I do here is make my own passata. I should have mentioned it as an alternative. For recipes like this I make my own because store-bought here is either too strong for this dish (Heinz) or too acidic. We are lucky to have dozens of beautiful ‘real’ ones available from small family firms at about one dollar plus for a litre bottle: would never buy ‘big brand’ like Heinz 🙂 !! Probably made from sweeter, riper tomatoes than I can access!! So pleased to see but not surprised that you make your own tomato sauce. Nothing irritates me more than chef’s/bloggers who suggest you buy store bought tomato sauces. Agree! And that applies not just to tomato sauce! A perfect example of how easy and quick cooking can be. I get so tired of people telling me that they have no time to cook. Especially with high quality canned tomatoes, this is a perfect year-round weekday dish to me! Nice indeed. I have a pork and cherries recipe that missed the cherry window. I’m in two minds about posting. I might wait the seven months…. Grazie! Sempre gradite le ricette veloci. I gamberetti si trovano surgelati tutto l’anno, così come i piselli (e qualcuno surgela i suoi). Anche il pomodoro si può preparare in estate per la stagione fredda, oppure evviva i pelati! This is a wonderful dish, Stefan, and I prepare a similar one with my homegrown cherry tomatoes. It is, as you say, a dish that can be made without a trip to the grocery. Right now, due to the foresight of a vendor at the farmers market, I’ve fresh peas looking for a purpose. You’ve reminded me that a great dish is right here within reach. Thanks!